Boat race or Goat Race! (Updated) | That's London Baby! Good morning to a hopefully sunny Saturday! Small update (Spoiler Alert): The 2015 results are in, Oxford had a good year with snatching the victory at all 3 events (Boat’s Race men and women as well as Goat’s race). Also, thanks to a feedback from one of the readers, who is in the know, I corrected the history section below- not only was the women’s race held first this year, but it was the first time, that there was a women’s race on this day! Thanks! The Oxford vs. Cambridge Boat Race is an English institution. Its watched by around 250 000 people on the bank of the River Thames and 15million (!) on BBC live Television. Its a race of two 8 people rowing boats of the two eternal competitors of the University of Oxford and Cambridge. Held for the first time in 1829, its been an annual event since 1856 and has been won 81 times by Cambridge and 79 times by Oxford (who are also the reigning Champions). This year, there is a novelty in History – not only will the women’s race will start FIRST, but its the first time the women’s race is held at the same day as the men’s. The Route is 4. 2 miles (6.8km) long and runs upstream from Putney Bridge to Chiswick Bridge. The Goat Race was a cheeky answer to all the frenzy around the real Boat Race and is now in its 7th year at Spitalfields City farm, who partner with TimeOut to make this their biggest annual fund raising event and to provide a nice afternoon out for the (local) families. Two Goats, “Oxford” and “Cambridge” , are running around a set course around the farm. There have been years with a third mystery contender “And” – who has even won the race last year, but its never sure if he or she will make an entry…. The Boat race starts this year at 16.50 with the women’s race and the men will race at 17.50. The race will last around 17 minutes. The Riverbanks and Pubs will be full all afternoon, with lots of music and festivals going on. Its a nice afternoon at the river. If you do want to watch in a pub, be there early, as they will be rammed with people, but you can also just wander around the Route during the afternoon and try to find a good riverside spot. There are two official festivals in Bishops Park in Fulham and in Furnival Gardens in Hammersmith. 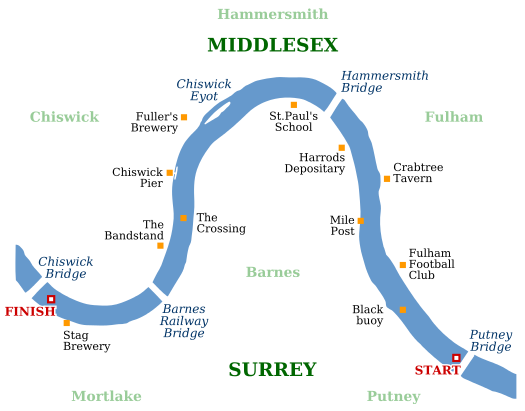 A few pubs along the route are The Blue Anchor and Rutland near Hammersmith Bridge (with lovely riverside Terrace), The Old Ship (who will be holding a Boat Race Festival), or the Dove. Tickets for the Goat Race are sold out. I am not sure if there will be tickets at the door, so a guess is to go there and check- but don’t bank on getting in. If not, no worries, lots to do in the area….. The race will be sometime between 2-5pm depending on the mood of the Goats, and Festival Action will be from 1-6pm. Watching the Boat race is easily turned into a nice afternoon out. You can wander at both sides of the River with several sights along the way. I have only been on the North side, so not sure what is in the South, but I heard that there are the official Races Marker Stones, marking start and finish of the race. Chiswick House and Gardens was built by architect William Kent for the Third Earl of Burlington in 1729. The Design is inspired by the classical Greek/Roman Temple style and is one of the finest examples of this type of building in the UK. The house homes a fine art and book collection, with a highlight being 8 landscape view paintings of Dutch Painter Rysbrack. A real highlights are the vast and lovely gardens. On Saturday, the House is closed, but gardens are open and free. If you want to see the House Sunday to Wednesday, it costs £6.10 for adults and is free to English Heritage members or holders of the National Art Pass. 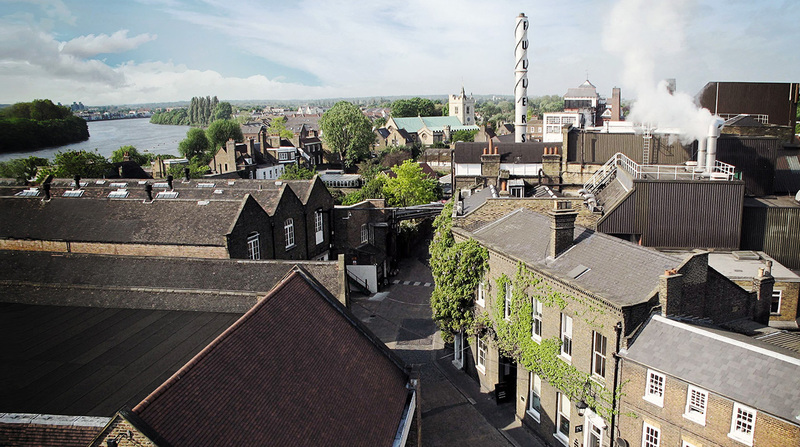 Fuller’s Griffin Brewery is located near Chiswick Bridge and has been standing there since1828. For the public, it houses a Brewery shop with all types of Merchandise, but also their standard and rare Vintage Brews. On Saturdays, the shop is open from 10-3pm. ← It’s Easter Weekend- Good Weather Edition!